Christmas Lights, Holiday displays and festive light shows to get you in the holiday spirit. As your Woodbridge VA Realtor, I always try to make it easy for you to find the best places to see Christmas lights near you in Woodbridge, Virginia. I have compiled a list of some of my Top Christmas Lights Near Me in Woodbridge VA like The Anderson's North Pole display in Woodbridge and Bull Run Festival of Lights. This year I have also included some festive traditions nearby Woodbridge for ideas to take out of town guests like ICE! at Gaylord National Resort. A home off of Cardinal Drive in Woodbridge. A tradition started more than 2 decades ago by owners, Mike & Teresa Anderson. This is a FREE Woodbridge Light is available from 5:30 p.m. to 9 p.m. This Woodbridge Holiday Light Show is full of colorful lights and manage to outdo themselves every year. The Jeager Family Light Display in Dale City has thousands of lights synchronized to music. Another local family with the Holiday spirit. You can help the Jeager Family with their Christmas traditions by donating canned goods when you visit. Check Facebook page Reagon Ct Lights. FREE, The Fairfax Town Square, formerly Kitty Pozer Garden, turns into a Winter Wonderland from December 5, 2015 to January 3, 2016. The home of the Fairfax Christmas Tree and animated light show. $15 a car Sunday-Thursday, $20 a car Friday-Saturday and Holidays. This drive through light show 2.5 miles long with 40,000 animated lights set to music. Located in Bull Run Regional Park, the Christmas Light display ends at a Holiday Village that also has an ice skating rink, carnival rides and food even the traditional hot chocolate. December 5, 2015 at 6 p.m. This is a one night event. It is FREE! There is something magical about seeing thousands of lights reflecting off the Potomac River. This Saturday, December 5 watch dozens of festive boats at the Parade of Lighted Boats in Alexandria. Tickets are $14-$34 available now until January 3, 2016. This huge indoor ICE! wonderland is so popular people come from all over to see. It is located at the Gaylord National Resort in National Harbor just over the bridge. This walk through holiday attraction has over 2 million pounds of hand carved ICE! sculptures. There are 7 rooms that re-tell the classic story "Santa Claus is Comin' to Town". There is fun for the whole family including ice slides and a live ice carving zone. Not really Christmas Lights near me but family fun to that will get everyone in the holiday spirit. Since 1923, the United States has had a National Christmas Tree in Washington DC. It is now surrounded by 56 smaller decorated trees knows as the "Pathway of Peace". This year's national tree lighting will take place on December 3 at 4:30 p.m. and will be available for viewing until January 1. Admission is FREE, Parking is $9. The National Zoo goes all out with Winter- themed displays thousands of lights through-out the zoo. Over 1/2 MILLION LED lights and displays. You must see the the 2-story animated fountain and the Gingerbread Village. You MUST purchase tickets in advance and range from $3-$14. 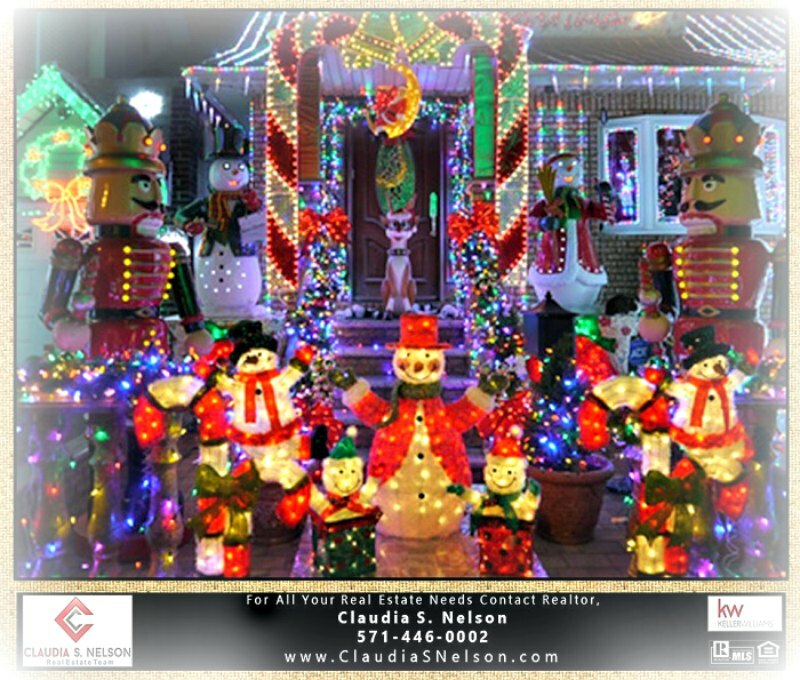 This list of Christmas Lights Near you in Woodbridge, VA has been brought to you by Woodbridge VA Realtor, Claudia S. Nelson. For all your Real Estate Needs, Call or Text Claudia S. Nelson 571-446-0002.